When it comes to jacks, floor jacks offer a greater vertical lift range than other types of jacks. Whether you want to change the oil on your family car or are looking for a floor jack to take with you to racing events, there are a wide variety of available to suit a range of needs and vehicles. To help you sort through all those options with minimum hassle, we have put together this floor jack buying guide including everything you need to know about choosing the right floor jack. 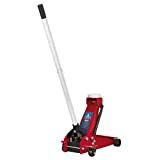 Aluminum Floor Jacks: Light and offering more portability, aluminum floor jacks are ideal for home car maintenance. Whether you need to change the oil or a flat tyre, these jacks are a good solution for non commercial use. Steel Floor jacks: Steel floor jacks are durable and sturdy and are a great asset to a workshop or garage. 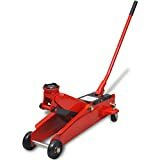 2 Ton Floor Jacks: 2 ton floor jacks are easy to maneuver and provide more portability and will left a family saloon vehicle without any problems. .
3 Ton Floor Jacks: 3 ton floor jacks can lift heavier vehicles, higher. If you are looking to work on larger vehicles such as 4 x 4s then this is the floor jack for you. 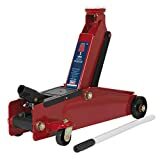 4 Ton Floor Jacks: Designed for heavier loads, 4 ton jacks and higher are best suited for car workshops where larger vehicles such as small trucks need to be worked on. Stability: The most important floor jack characteristic is its stability and jacks that are able to securely lift varied size vehicles securely without slipping are rated very well. While units that do not, are not received well at all. 3 ton floor jacks offer the most flexibility according to consumers and choosing a quality brand with good reviews will ensure stability. 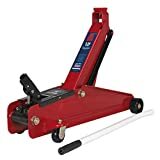 Build: The weight of a floor jack is one of the most talked about features of a floor jack, where jacks that are durable yet light enough for easy positioning being the best rated units. When it comes to lightweight, aluminum receive better comments where as steel jacks seem to be more trusted for busier workshops where movement of the jack is not important. The first thing to check is the weight capability of the vehicle or vehicles you will be lifting and working on, and comparing it to the maximum load capacity of the floor jack. For maximum safety, choose a jack with a maximum load capacity that is less than that of the vehicle you will be lifting. 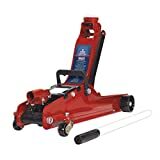 For commercial use, or in the case where you will be lifting trucks and other larger vehicles opt for a professional floor jack that includes air assist features which will allow you to use a air cylinder to do the heavy work for you. A floor jack should at least have wheels for easy maneuvering, a handle for positioning and hydraulic cylinders for lifting. 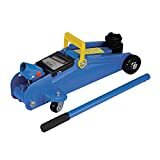 If you are looking to do a variety of maintenance on a variety of weighted vehicles, an adjustable floor jack provide more flexibility. Some of these jacks can lift up to 20 tons and are a good choice for mechanics or car hobbyists. The lift range of a floor jack refers to minimum and maximum lifting heights of a floor jack. For example, a lift range from 4 - 18 inches will mean that the jack will lift the vehicle up to 18 inches high. Comparing a floor jack’s lift range to what you require will ensure it gets to the hights you need, safely. Because performance vehicles have lower suspensions, choose a aluminum floor jack that has been designed with improved access to make suspension and modifications easier. Safety accessories that go hand in hand with a floor jack include jack stands to protect you should the jack slip and car ramps to help prevent sliding and extra comfort while working on the car. 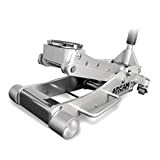 Arcan: A brand under the PowerStation name known for quality automotive and hardware products, Arcan are a top rated floor jack brand. OTC: Under the umbrella of Bosch, OTC is a leading supplier and manufacturer of automotive accessories and tools, including their top rated floor jacks. Blackhawk: Blackhawk is a brand of the Shinn Fu Company of America, Inc (SFA) and have been manufacturing and distributing hydraulic lifting equipment for over 40 year.